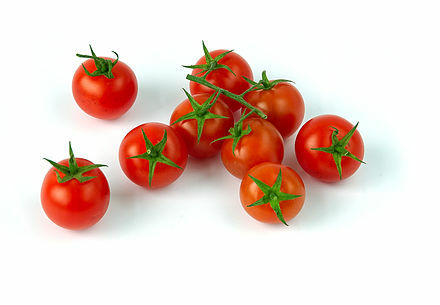 Grape and cherry tomatoes are a family of tomatoes characterized by small shapes. They take their names from the shapes of the grape and cherry, respectively. Although, they look the same with the same health benefits, there are notable differences between them. They are also interchangeable in many dishes even though they have distinct flavors. The article explores the difference between grape tomatoes and cherry tomatoes. Mostly used in stuffing in many recipes, cherry tomatoes are preferred by chefs due to their juicy and sweet taste. They also add a sour taste to recipes. They are sweeter than the grape tomatoes and big tomatoes. Also, they are bigger than grape tomatoes. Cherry tomatoes are watery which makes them squirt when biting into them. Because of this watery content, cherry tomatoes relatively have a shorter lifespan hence they are less preferred by farmers. It is easy to squash them as they have a thinner skin. Their less popularity is attributed to their susceptibility to get damaged. Cherry tomatoes grow spaced on a pine tree. They are available in a variety of colors, viz. yellow, orange and red. Like other tomatoes, cherry potatoes are rich in lycopene ꟷ a nutrient renowned with cancer-fighting properties. 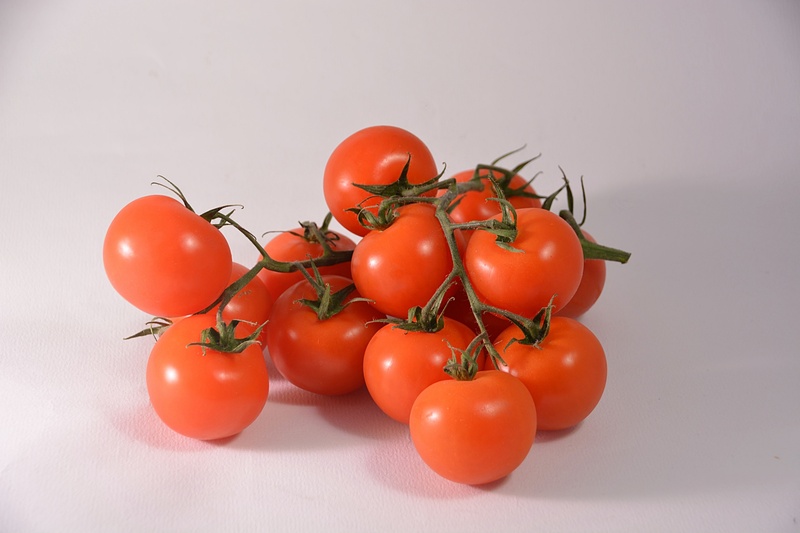 The tomatoes also possess Vitamin A and C, which are known for a variety of health benefits such as good vision, strengthening of the immune system, enhancing heart health, and improving skin health. Cherry tomatoes can be eaten raw or as ingredients in a plethora of recipes. Recipes that call for cherry tomatoes can also accommodate the less juicy grape tomatoes. Grape tomatoes are called grape because their shape resembles that of grapes. They have an oblong shape and are tiny compared to cherry and big tomatoes. Grape tomatoes are often preferred by farmers to pack and distribute due to their hardness and less susceptibility to be squashed. They are easy to pack hence big farmers produce them in large quantities. Many shops and restaurants are fond of preserving grape tomatoes due to their long shelf-life and thick skin. Because of their little water content and less sweetness, grape tomatoes are less likely used in recipes where stuffing is desired. They are still sweeter than big tomatoes. Like cherry tomatoes, grape tomatoes can be eaten raw or in recipes. They can substitute cherry tomatoes in recipes. This substitution is often attributed to the availability of grape tomatoes throughout the year in many stores. The growth cycle of cherry and grape tomatoes is the same. Grape tomatoes also have lycopene, Vitamin C and A. Essentially, the health benefits are the same in many aspects although the sweetness and juiciness are different between these tomatoes. Grape tomatoes, unlike cherry counterparts, are only available in a red color. When they grow, they resemble the grapes and grow in clusters. Grape tomatoes are small tomatoes that resemble the shape of grapes hence they are referred to as grape tomatoes. They have a thicker skin and have an oblong shape. Cherry tomatoes, on the other hand, are bigger than grape tomatoes, and resemble the shape of an actual cherry although not precisely the same size as the cherry. Cherry tomatoes are thinner. Grape tomatoes have less water content and are less juicy and less sweet. Cherry tomatoes have too much water content and they show this by squirting when biting into them. Both tomatoes have lycopene, Vitamin A and C known for their vital role in health. Both tomatoes can be prescribed for certain recipes. However, it is possible to use them interchangeably. Cherry tomatoes, due to their sweetness and juiciness, are commonly used in recipes. To use cherry tomatoes in recipes that call for grape tomatoes, they must be cut as they are bigger than the grape tomatoes. Cherry tomatoes are thin and more watery; as a result, they have a short shelf-life. This explains why shop owners predominantly have grape tomatoes than the cherry ones. Grape tomatoes have a longer shelf-life. Both tomatoes have the same growth cycle. Cherry tomatoes grow while spaced on the pine tree whereas grape tomatoes grow in clusters like grapes. Grape tomatoes are only available in a red color whereas cherry tomatoes are available in yellow, red and orange. Grapes tomatoes are thicker and have a long shelf-life. As a result, farmers prefer farming them. They are easy to transport. Cherry tomatoes are more juicy and sweet hence they are called in many recipes. They both have lycopene, Vitamin A and C.
Cherry tomatoes are available in yellow, orange, and red while grape tomatoes are only available in red color. Both tomatoes can be eaten raw or included in recipes. Lusi Madisha. "Difference Between Grape Tomatoes and Cherry Tomatoes." DifferenceBetween.net. 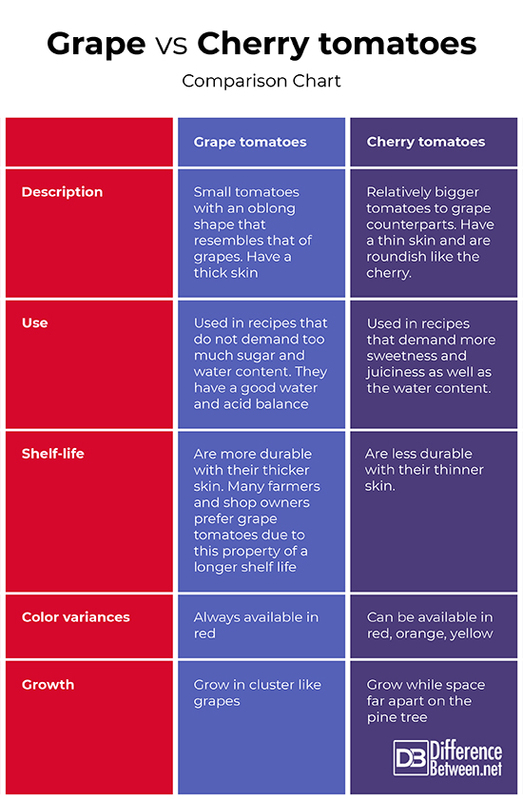 November 16, 2018 < http://www.differencebetween.net/object/comparisons-of-food-items/difference-between-grape-tomatoes-and-cherry-tomatoes/ >. Linnea Covington (July 7, 2014). What’s The Difference between Cherry and Grape Tomatoes? Accessed at: http://www.foodrepublic.com/2014/07/07/whats-the-difference-between-cherry-and-grape-tomatoes/. Accessed on: 15 September 2018.